← Don’t Fence Me In! For the last eleven years, late March or early April brought a special thrill to my morning walks – the blossoming of the six English Hawthorn trees outside the U.S. Naval Academy‘s Main Gate. Among the trees a modest marker and bronze plaque announces these trees as a gift from Captain John Smith. I silently thank Captain Smith for this thoughtful gift. The Hawthorns’ blooms are always among the first to appear, right along with the daffodils and forsythia. Their stark grey trunks don heady bouquets of dazzling pink and white blossoms that glow in the morning light. Their brilliant bouquets exude a halo of fragrance, fresh and slightly sweet. I catch their aroma from around the corner, before I see the rosy petals against the Academy’s white, brick wall. 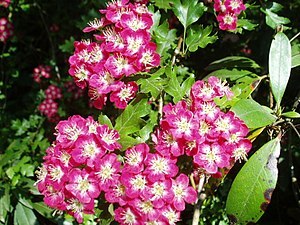 The awakening of the English Hawthorn has been an event I looked forward to each spring. But, these six, trees were more than just pretty faces. Their identities, like our own, were complex and intriguing. In Middle English a haw is a hedge. Such sturdy trees that grew slowly and remained of middling height were helpful living-fences. Add to their sturdy compactness the thorns that pepper their branches and you have an ideal border hedge. Thus, the English haw-thorn tree. The English Hawthorn trees are ubiquitous, so much so that it’s uncertain which came first, the tree or the term. These thorny trees serve throughout the English countryside to discourage roaming horses and sheep from wandering too far afield. The Hawthorns of Annapolis had no shepherding duties. My six friends provided slight shade for pedestrians, and few birds bothered to seek perches among the thorns. The summer Hawthorns were rather sad fellows, with scruffy, grey bark and small, serrated, olive-green leaves. Then, in mid-August, the Hawthorns‘ foliage would begin to brown and curl, and soon the sidewalk was strewn with dead leaves. I saw their early disrobing as a harbinger of the fall to come. Not for the Hawthorns the elegant golds and ruby reds of their cousins the maples and oaks. I had to remind myself that these sad trees would be the very first to come back to life in the spring – with the showiest and most delicious display. That was my comfort. These sturdy, ordinary companions of my morning walks retired early to their winter garb, but early awoke with exceptional glory. What made these trees particular favorites of mine was that for most of the year they were nondescript, calling no attention to themselves. But once a year, in the spring, they immodestly paraded their sensual beauty for all to enjoy, enfolding passers-by in their heady color and fragrance. Last September these six companions of my mornings were felled. It seems the early dropping of their leaves was a symptom of a disease common to the Hawthorn. So, March has come and gone, and now I walk past the newly planted, American dogwoods. And I find myself mourning my English friends – their fragrance and beauty lost from the early spring mornings but vivid in my memory. This entry was posted in Nature and tagged Botany, Garden, Hawthorn, Henry Mitchell, Plant, Tree, Wikipedia. Bookmark the permalink. I enjoyed your description. I’m sorry to have missed the fragrance. I don’t have much sense of smell, and there are numerous hawthorns in my neighborhood. It is unfortunate if you are unable to smell the Hawthorn’s blossoms. The scent is intoxicating and wafts far and wide. I love this. Each year certain plants and trees transport me to a different time and place where the story of that tree or this plant resonates with a special part of my past — the Red Bud tree that I acquired on Earth Day at Quiet Waters the first spring we lived on Jefferson Street as a twig and now blooms deep purple each spring, or the azaleas my mother and George bought when the girls were born — one for each. I don’t know the Hawthorns, you’ll have to show me sometime. Such a vivid description of the lovely Hawthorne’s and your stroll through the academy brightening the day of those you pass as the Hawthorne’s did for you. Sad they are gone and hoping the Dogwoods don’t share the same fate. Jan, “Good-by to All That…” brought light and energy to my spirit this morning! Thanks so much for including the picture of the gorgeous blossoms!!! So sad to read the last line… I was going to take a jaunt over there this evening to see the trees I’d been walking by for 20 years without noticing! Yes, we often overlook the beauty right before us – and then, it’s gone. So glad to learn that you too enjoyed the lovely Hawthorns for all those years. I think I miss their fragrance most. The Great Wall of Eastport is a sad scar on the village atmosphere, indeed. Beautiful observations on the world which surrounds us and which we often don’t observe. I am sorry for the passing of your six friends, but they will live on in your memory and perhaps in a photo or two. A lovely memory to share with us! Henry Mitchell wrote glowingly of the the hawthorn. I wonder if there is a collection of his columns — there should be, writer lady!